To combat food fraud, Italians have developed new laser techniques to determine whether that extra virgin olive oil is really as pure as the label says. Researchers at Florence’s Institute of Applied Physics teamed up with the photonics researchers at Vrije Universiteit Brussel to devise a series of high-tech tools that can also be applied to beer and milk. By zapping olive oil with fiber-optic and micro-optic devices and using a technique called scattered colorimetry obtained a “signature” for extra virgin olive oils that can attest to authenticity as well as fatty acids and antioxidant content that make olive oil good for you. Micro-optic sensors are also employed to detect aging aromas. After running tests, researchers also developed a software that can monitor nutrition content from pressing to bottle. What does this mean for the average shopper? Researchers are at work on smart bottle caps that can tell before you do that the green gold has had better days or keep olive oils that have been mixed with by-products, such as olive residue, off the shelves. The research highlights the importance of olive oil a cornerstone of the traditional Italian diet — researchers here believe it is “brain food” for children — and the national preoccupation with “counterfeit” or falsely labeled foods. Image: CC-licensed, thanks to Shishberg on Flickr. Home brew? Pot steeping in alcohol. Photo: ANSA. 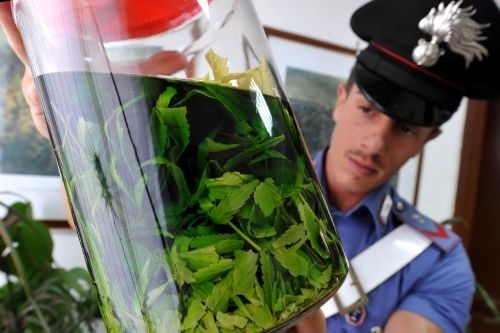 Police in Italy arrested a 60-year-old Naples man for a concoction he made out of marijuana. 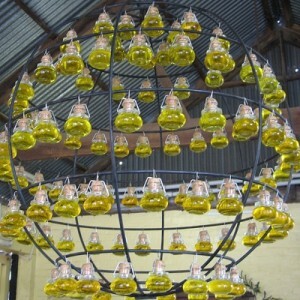 They called his invention “marjiuancello,” in honor of the lemon liqueur limoncello commonly found there. Manlio Chianchiano had a home cannabis garden of 10 plants that he grew with the idea of turning his home distillery into something special. It’s fairly common to find homemade liqueurs in Italian households — from limoncello to nocino (made from walnuts) and different types of bitters — but this is the first time the very Italic knack for invention has been taken to this extreme. We’ll never know if his libation was any good — he was still macerating the pot leaves in pure alcohol when police came in to check up on reports that he was growing marijuana at home. 25 years ago, Italian families ate more meat, drank more wine but put less fish and pasta on the table. La famiglia also usually shopped in small local stores — there were five times fewer supermarkets — and 85% of the time ate at home. These are some of the changes tracked in a study (.pdf Italian only) by national food industry lobby Federalimentare to mark its 1983 founding, back when Socialist Bettino Craxi first stepped into office and pop hit “Vamos a la Playa” had Italians singing into their watches. Rapid changes after World War II first revolutionized Italian eating habits, breaking some long-standing stereotypes. In the early 1950s, the Italian mamma spent a good chunk of her day preparing a hearty lunch, while her new millennium counterpart, less likely to be a stay at home mother, spends just a third of that time in the kitchen. In the post-war period, Italians also spent half the family income on food. From 1983-2008, money spent on groceries dropped eight percent to 17.7% of the budget. They now eat 10% less meat, 10% more pasta and bread but about the same amount (18%) of fruit and veg. Beverages have flip-flopped: Italians now spend 5% of the budget on juice, bottled water and soda, five times more than in the 1980s when that same percentage was allotted for wine and spirits. Some staples of the Italian postwar diet that have now disappeared include smoked herring (often eaten with polenta), tinned milk and carob beans, sucked like candy. Top-notch Italian wine maker Allegrini will offer a bottle of wine (to be drunk at a later date) to the driver offering to get friends who have imbibed home. The designated driver promotion doesn’t include the vineyard’s most expensive wines, but the Allegrini red called Palazzo della Torre (a “baby Amarone“), a well-respected nectar of the grape that retails for at least $18 USD, depending on the vintage. 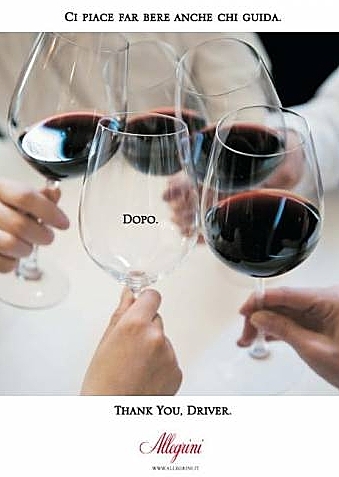 The promotion, aimed at Italian restaurants, was launched on the eve of the Vinitaly wine fair. Just got the first shipment from Cascina Cornale, a farmer’s coop based in Piedmont that delivers weekly to northern Italian regions, including Val d’Aosta, Piedmont, Lombardy and parts of Liguria, Tuscany and the Veneto. A friend of mine swears by it, otherwise it was the kind of good idea that given Italian execution would’ve stayed a good idea, rather than something actually tried out. You pay for the month in advance, delivery is included. 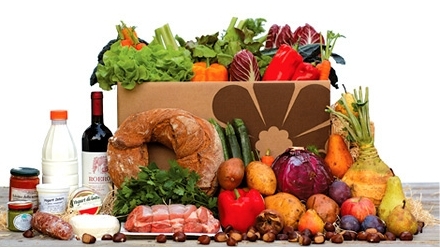 Clients either choose online what they want every week, it’s slightly more expensive if you choose, or you get a box of whatever’s in season plus a few basics. Here’s what arrived in the 1-2 person “surprise” box, which costs €38, nearly $47 if you’re dealing in treacherous dollars. About a pound each of two kinds of pears, apples, kiwis, turnips, spinach, a head of cauliflower, a head of radicchio, a big slice of pumpkin (soup or risotto? not sure yet) a liter of fresh milk, six eggs, a whole brown trout, a generous wedge of toma cheese, two small jars of plain yogurt, a pack of balsamic candies (perfect for the cold season), some red onions and a spot of lard. Said friend warned me about the perils of the surprise box (anyone know what to do with a whole trout?) after I’d signed up. But on this rainy Milan day, I’m still glad not to have to go do the shopping. Times may change but over half of all Italians still break bread together on long, big Sunday lunches. Though brunch has made headway in Italy recently, especially in cities and among young people, 52% of the 1,834 families polled by the Accademia Italiana della Cucina (Academy of Italian Cuisine) still follow the Sunday lunch tradition. The menu? Usually cold cuts and crostini for starters, then pasta and roast meat plus fruit, dessert and coffee. This prodigal spread is still usually prepared by women, though two out of 10 men claim they “lend a hand” for Sunday cooking. Younger generations, say the study, aren’t interested in cooking, but are happy to sit down and eat with the extended family. Italian researchers nosing around have discovered traces of DNA from Chinese truffles mingled with prestigious, costly local black truffles. The trouble with truffle intermingling? Scientists say it is one reason, along with environmental changes, that the prized tuber has become even more scarce in recent seasons. Truffle cousins from Asia sprung up in European markets in the 1990s. Among them is the Tuber indicum from China, a close relation of the Italian black truffle, Tuber melanosporum. The two mushrooms share genes and have a similar structure and shape. 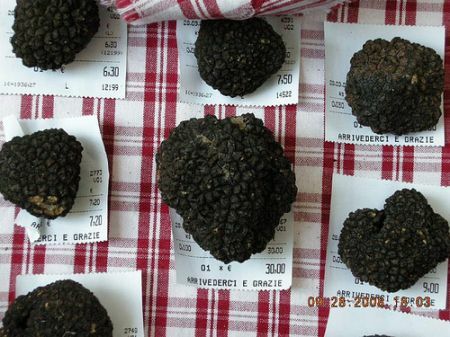 Truffle conossieurs, willing to pay between €200 and 600 per kilogram (USD$130–$380 per pound) for this black gold, say the Asian variety lacks the taste and fragrance of Italian truffles. During an inspection of a black truffle farm near Turin, where a dozen years ago T. melanosporum truffles were planted, researchers of the Institute for Plant Protection (IPP) of the National Science Council identified DNA of T. indicum in the soil and roots. Italian scientists are now defending the national dish, plagued by price hikes and cut by those counting calories, as a mood improver. His remarks come before the 10th edition festival dedicated to pasta in all its varieties called I Primi d’Italia, the name a play on the dish as a first course and the best in Italy. 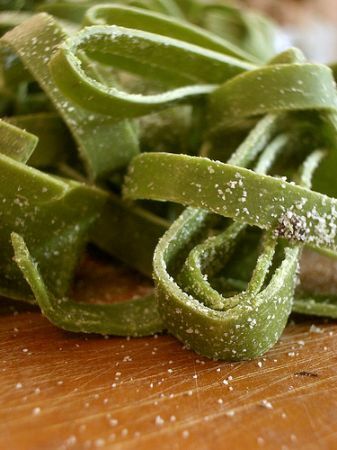 If pasta is the ultimate mood food, Italians must be a happy bunch: they are among the top consumers of maccheroni, tortellini and linguine on the planet. Each Italian winds up some 61 pounds (28 kilos) of spaghetti a year. 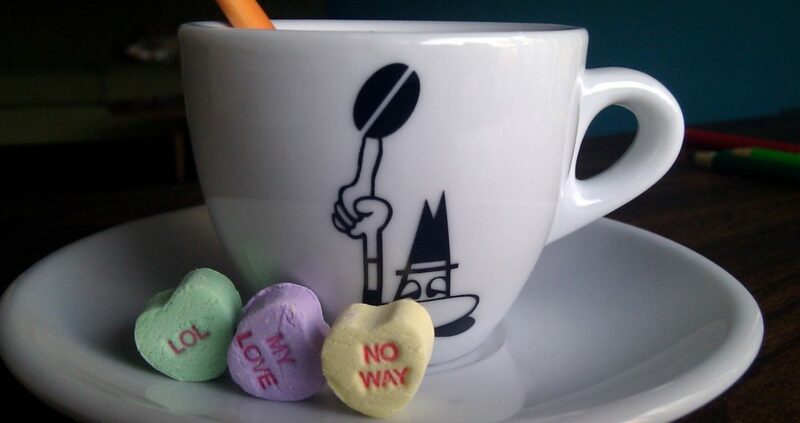 Not to be outdone by New York, a restaurant in Italy’s fashion capital has opted to equip the menu with calorie counts. The American initiative, already weighed down by an appeal, would only cover restaurant chains. But the Ristorante Romani, which voluntarily decided to list just how many calories the risotto alla milanese packs is an upscale, family-run venue in the city’s historic center. To do it right, the restaurant brought in Italian dietitian to the stars Nicola Sorrentino. 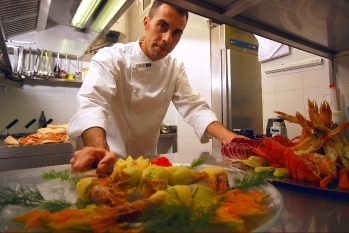 His outside expertise means there will be no flubbing on exactly how much the tortelloni with scampi, figs served with a “cascade of flowers” (edible? do those count as carbs or protein?) may bulge from your bikini. Other items under scrutiny include linguini with lobster and cherry tomatoes, risotto alla pescatora and Chateaubriand with potatoes. It’s hard to imagine the truly diet-conscious even glancing at dessert items such as tiramisu, torta della nonna and the house specialty, a killer Neopolitan ricotta cake (pastiera alla napoletana). With prices hovering around 45 euro a head ($70) sans vino, I haven’t been there since the dot-com boomlet allowed me to entertain clients on the company tab, but have heard that last year’s slight makeover has made the place even more comfortably old-school than it was. Some 300 women in six European countries were filmed as they ate five foods: vanilla ice cream, chocolate, cereal bars, yogurt and apples. Not surprisingly, ice cream and chocolate produced the most happy expressions across the Old Continent. More at Wired.